To those readers, then, who think these recipes are outside of your reach (and, again, I acknowledge that I’m not describing most of you) I have a recipe for you. 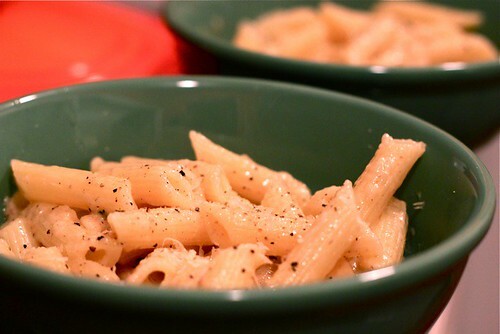 It’s Penne with Brown Butter, Nutmeg and Parmesan and I used to write about it all the time on the blog when I was a bachelor; it’s a dinner you can whip up easily for yourself after coming home from work. 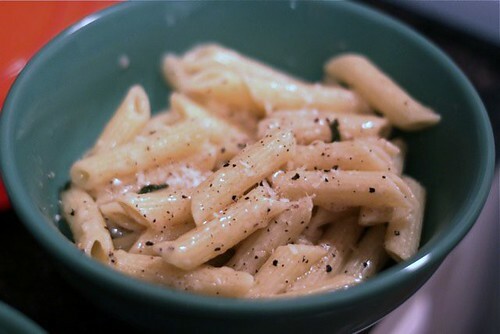 All you need is a pot, a pan, a box of penne, a stick (or less) of butter, whole nutmeg (so much better than the pre-ground stuff), a hunk of Parmesan cheese, salt and pepper. This is comfort food with a sophisticated flair. Now here’s what you do…. 2. When it’s boiling like crazy, add a big pour of salt (enough to make the water salty; be brave, dip your pinky in and taste it). 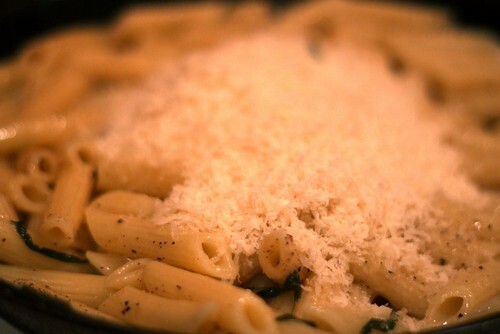 Add your box of penne and half-cover it with the lid to bring it back to that rapid boil. Then remove the lid so it doesn’t bubble over. 3. While all of that’s happening, add your butter to a skillet (non-stick or regular, doesn’t matter) and begin melting it on medium heat. 4. Eventually, the butter will melt and start sizzling. Here’s where you let it brown. It’s easier to see it brown if you’re using a regular metal skillet (one reason not to use non-stick) but if you’re using non-stick, just use your nose. When it browns, it’ll start to smell nutty (should take 5 minutes or so on medium heat). One thing: don’t let it burn! 5. Around the point when it starts to brown, add the sage if you’re using it (but really, you don’t need it), the nutmeg and some of the pepper. 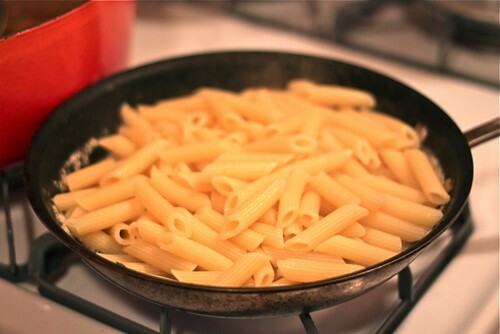 Then ladle in one cup of the starchy, salty pasta cooking water straight from the pot with the pasta. 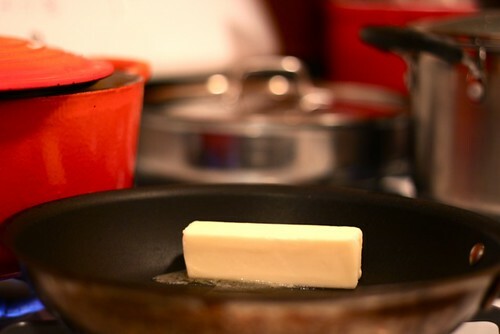 The butter pan will sizzle and steam; look down: there’s your sauce! 6. 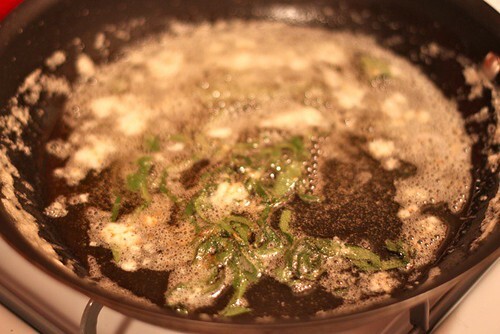 Now you let that sauce simmer while your pasta continues cooking. If it reduces too much, add more pasta cooking water. Lower the heat. Eventually, ti’ll be time to start testing your pasta: lift out a noodle, run it under cold water and taste. Is it just al dente? Not raw but not 100% cooked-through? Then the time has come! …is it wet on the bottom? There should be some liquid in there. If there’s not, add another ladleful of pasta cooking water. Then crank up the heat and toss it all around, adding salt, pepper and more and more fresh nutmeg as it goes, tasting all the while, until most of the liquid’s gone and the pasta is perfectly cooked and it tastes very delicious. Now you’re going to make it even more delicious. Stir that through, taste, taste, taste and see if needs more nutmeg or pepper. 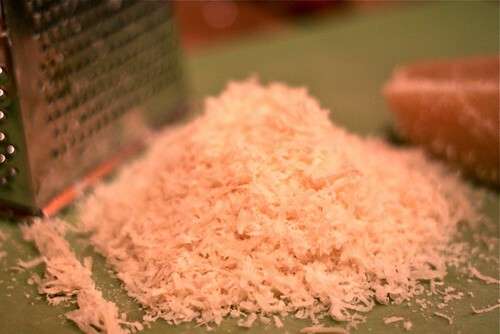 Spoon into a bowl, top with more pepper and Parmesan and serve with whatever wine you have already open and fermenting in your fridge. There you go: the easiest pasta dinner in the world! You have no excuse not to make it.